Socially conservative policymakers are seeking to take public funding for family planning away from Planned Parenthood and other providers focused on reproductive health, suggesting that federally qualified health centers (FQHCs) could take their place. FQHCs are an integral part of the publicly funded family planning effort in the United States, but it is unrealistic to expect these sites to serve the millions of women who currently rely on Planned Parenthood health centers for high-quality contraceptive care. The Title X national family planning program’s ability to yield significant health and economic benefits for women, families and society relies on a diverse network of safety-net providers—a network that should include, but cannot be limited to, FQHC sites. The Trump administration and many social conservatives in Congress and across state governments have put federally qualified health centers (FQHCs) front and center in their attempts to pull public funding from other types of safety-net providers—specifically, those that provide abortion-related services. Proposals to significantly expand FQHCs’ responsibility for meeting the need for publicly funded contraceptive care have taken two main forms. First, policymakers are moving to exclude Planned Parenthood from various public funding streams, asserting that Planned Parenthood health centers are unnecessary because FQHC sites are plentiful and could easily meet women’s need for family planning care. Second, these same policymakers are seeking to eliminate or undermine the Title X national family planning program by directing Title X funding to FQHC sites while excluding providers focused on reproductive health, some of which offer abortions (using non-federal funds) in addition to contraceptive and other basic health care. Although FQHCs have become an important part of the publicly funded family planning effort, a new Guttmacher Institute analysis finds that they cannot be expected to deliver contraceptive care to the large numbers of women who currently rely on Planned Parenthood or other Title X–supported providers. In fact, to suggest otherwise willfully oversimplifies the considerable challenges FQHCs would face in doing so, and ignores how these proposals put millions of U.S. women at very real risk of being unable to obtain the basic care they need. FQHC sites offering contraception are part of a broader family planning safety net. Nationwide, there are approximately 10,700 safety-net health centers providing family planning services.1 (A safety-net family planning center is a health center that provides contraceptive care, using various federal, state and local funding streams to offer reduced-cost or free services.) These service sites are operated by a diverse range of public and nonprofit entities, including FQHCs, Planned Parenthood affiliates, health departments, hospitals and other independent agencies. Together, these safety-net providers delivered contraceptive care to 6.2 million women nationwide in 2015. FQHCs are an essential part of the nation’s overall health care safety net, serving 25 million people annually, seven in 10 of whom live at or below the federal poverty level.2 Their role has been expanded by the Affordable Care Act (ACA), which invested billions of new dollars into FQHC infrastructure, driving considerable nationwide growth in the number of sites and their capacity.3 In conjunction with their overall growth, FQHC sites have become increasingly integral to the national publicly funded family planning effort. 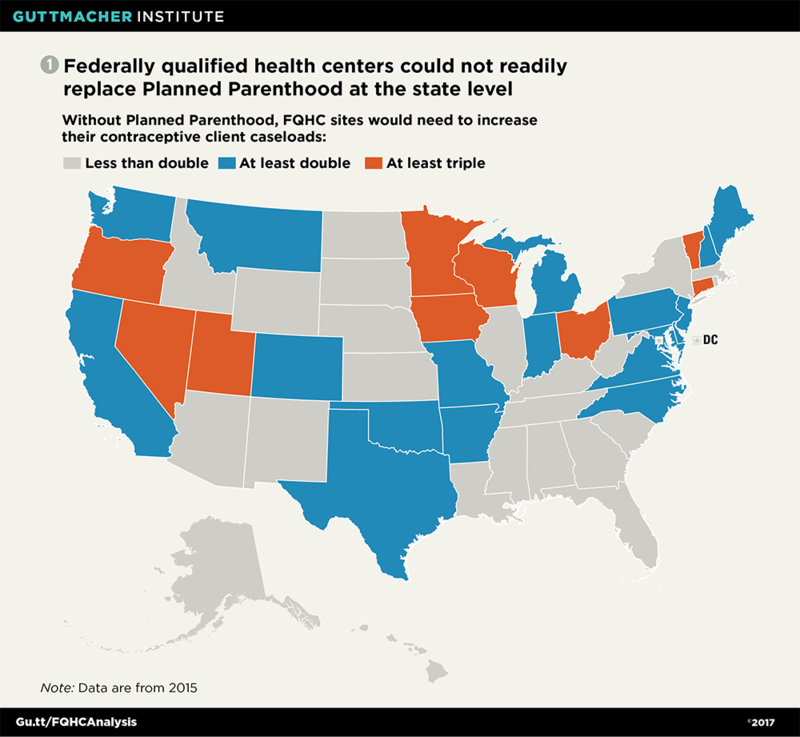 FQHC sites could not readily replace Planned Parenthood. 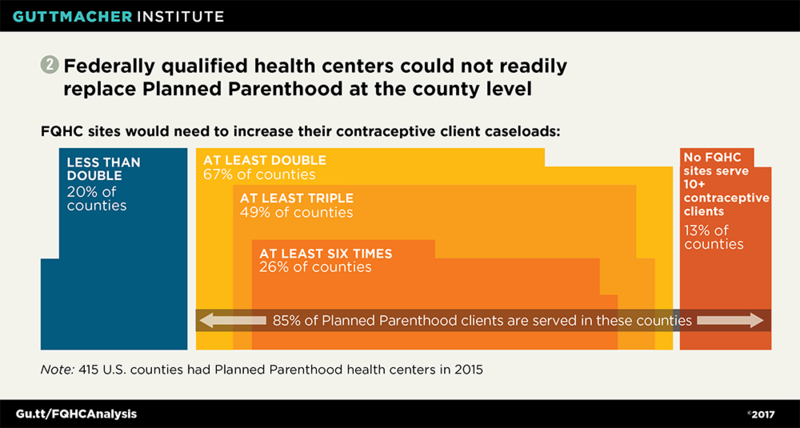 Despite their growing importance to the family planning safety net—and policymakers’ assertions to the contrary—FQHCs could not readily replace Planned Parenthood health centers. To understand why, it is essential to consider not only how many of each provider type are currently available, but also the number of contraceptive clients they are able to serve and the quality of the care delivered. Having expanded since implementation of the ACA, FQHCs now operate many more individual family planning sites than do Planned Parenthood affiliates.1 However, Planned Parenthood health centers serve a disproportionately high share of clients who rely on the family planning safety net. Even though Planned Parenthood health centers account for just 6% of all safety-net family planning providers, these sites serves 32% of all safety-net contraceptive clients.1 By comparison, FQHC sites account for 54% of all safety-net family planning sites while serving 30% of all safety-net contraceptive clients. This makes sense, given that the average FQHC site offering contraceptive care serves 320 contraceptive clients in a year, while the average Planned Parenthood health center serves 2,950. This analysis shows that if congressional leadership were successful in cutting Planned Parenthood health centers out of the family planning safety net, it would be unrealistic to expect FQHC sites that offer contraceptive care to fill that considerable gap. In 27 states, these FQHC sites would have to at least double their contraceptive client caseloads to do so, and in nine of those states, they would have to at least triple them (see map).5 Nationwide, it would mean taking on an additional two million contraceptive clients currently served by Planned Parenthood. At the county level, the gaps in the safety net that would be created without Planned Parenthood are particularly apparent. In 13% of the 415 U.S. counties with Planned Parenthood health centers, there are no FQHC sites providing contraceptive care (see chart 2).5 In another 67% of these counties, FQHC sites would have to at least double their capacity in order to serve all of the female contraceptive clients currently served by Planned Parenthood. In fact, in 26% of the 415 counties, FQHC sites would have to serve at least six times the number of contraceptive clients as they do today. Moreover, FQHC sites frequently perform worse on critical indicators of the quality of contraceptive care than do Planned Parenthood health centers (see “Understanding Planned Parenthood’s Critical Role in the Nation’s Family Planning Safety Net,” 2017). For example, Planned Parenthood sites are much more likely to offer the full range of contraceptive methods, which helps women identify and obtain the methods that work best for them.6 Planned Parenthood is also particularly effective at helping clients quickly start their chosen methods, by offering services such as same-day insertion of an IUD or implant and on-site dispensing of oral contraceptives. FQHC sites alone could not sustain the reach of the Title X program. As is true for the broader family planning safety net, the Title X family planning network consists of a similar range of providers: sites operated by FQHCs, Planned Parenthood affiliates, health departments, hospitals and independent agencies. And although FQHCs play an increasingly important role in serving Title X clients, if policymakers were to limit eligibility for Title X funding solely to FQHC sites, many women would find it exponentially more difficult to access the affordable, high-quality care that Title X helps to guarantee. For nearly 50 years, the Title X program has been the sole source of federal funding dedicated entirely to family planning. About one in three (3,700) safety-net family planning centers receive Title X funds, collectively serving nearly four million women annually across the country.1 Among women who obtain contraceptive care at some type of safety-net health center, six in 10 receive that care from a Title X–supported site. Moreover, the Title X program has long set the bar for family planning care, helping providers to deliver high-quality, confidential and affordable family planning services to those in greatest need (see “Why We Cannot Afford to Undercut the Title X National Family Planning Program,” 2017).7 Providers that receive Title X funding are more likely to offer women the full range of contraceptive method options, and to minimize barriers to starting those methods.1 They also must ensure confidentiality for all clients. FQHCs would face immense challenges if they were asked to serve all the women who currently rely on many different types of providers for Title X–supported care. FQHC sites providing contraceptive care would have to at least double their contraceptive client caseloads in 41 states, and at least triple them in 27 states, in order to maintain Title X’s current reach.5 Nationwide, this would add up to an additional 3.1 million clients. At the local level, there are Title X sites in just over 2,000 U.S. counties.5 In 33% of these counties, there is no FQHC site providing contraceptive services, meaning women living there could lose access to Title X–supported services altogether (see chart 3).5 In another 47% of these counties, the FQHC sites that offer contraceptive care would have to at least double their contraceptive client caseloads in order to serve all of those currently served by other Title X sites. In 24% of counties with a Title X site, FQHCs would have to serve at least six times their current number of contraceptive clients. FQHCs are indispensable, and they can only do so much. As necessary and effective as FQHCs are, they do not have the capacity to serve as the sum total of the nation’s family planning safety net. Second, FQHCs do not, and cannot, specialize in reproductive health care. They are charged with meeting the primary care needs of individuals of all ages, from infants to the elderly. They must provide each patient with a broad range of services, from vaccinations to dental and vision care to mental health services—all of which they would have to offer to any new contraceptive clients, as Rosenbaum points out.11 Expecting FQHC sites to expand their capacity to deliver all of these services to millions of additional clients, and to consistently provide family planning services in a way comparable to Planned Parenthood or other Title X providers, is unrealistic. The suggestion that FQHCs become the main source of publicly funded family planning care is a matter of political convenience, not a viable policy proposal. At the same time, the Trump administration and many social conservatives in Congress are seeking to limit the federal funding streams on which these providers rely, to roll back the coverage advances of the ACA and to scale back federal investment in Medicaid. Collectively, these proposals would leave tens of millions of largely low-income individuals uninsured and create renewed demand for publicly funded services—while at the same time undermining FQHCs’ viability. If these policymakers are serious about supporting effective, efficient health care systems capable of meeting the demand for high-quality care, they should invest substantially not only in FQHCs, but also in the safety-net providers and programs most able to deliver family planning services to the largest number of women who need it. This article was made possible by a grant from The JPB Foundation. The conclusions and opinions expressed in this article, however, are those of the author and the Guttmacher Institute. 1. Frost JJ et al., Publicly Funded Contraceptive Services at U.S. Clinics, 2015, New York: Guttmacher Institute, 2017, https://www.guttmacher.org/report/publicly-funded-contraceptive-services-us-clinics-2015. 2. National Association of Community Health Centers (NACHC), America’s Health Centers, 2017, http://www.nachc.org/wp-content/uploads/2017/03/Americas-Health-Centers_2017.pdf. 3. Paradise J et al., Community Health Centers: Recent Growth and the Role of the ACA, Kaiser Family Foundation (KFF) Issue Brief, Menlo Park, CA: KFF, 2017, http://kff.org/medicaid/issue-brief/community-health-centers-recent-growth-and-the-role-of-the-aca/. 4. KFF, Community health center delivery sites and patient visits, 2015, State Health Facts, http://kff.org/other/state-indicator/community-health-center-sites-and-visits/. 5. Frost JJ and Zolna MR, Response to inquiry concerning the availability of publicly funded contraceptive care to U.S. women, memo to Senator Patty Murray, Senate Health, Education, Labor and Pensions Committee, New York: Guttmacher Institute, May 3, 2017, https://www.guttmacher.org/article/2017/05/guttmacher-murray-memo-2017. 6. Zolna MR and Frost JJ, Publicly Funded Family Planning Clinics in 2015: Patterns and Trends in Service Delivery Practices and Protocols, New York: Guttmacher Institute, 2016, https://www.guttmacher.org/report/publicly-funded-family-planning-clinic-survey-2015. 7. Gavin L et al., Providing quality family planning services: recommendations of CDC and the U.S. Office of Population Affairs, Morbidity and Mortality Weekly Report, 2014, Vol. 63, No. RR-4, https://www.cdc.gov/mmwr/pdf/rr/rr6304.pdf. 8. Health Resources and Services Administration, U.S. Department of Health and Human Services, The Affordable Care Act and Health Centers, no date, https://www.hrsa.gov/about/news/2012tables/healthcentersacafactsheet.pdf. 9. NACHC, Staffing the Safety Net: Building the Primary Care Workforce at America’s Health Centers, Bethesda, MD: NACHC, 2016, http://www.nachc.org/wp-content/uploads/2015/10/NACHC_Workforce_Report_2016.pdf. 10. Rosenbaum S, Planned Parenthood, community health centers, and women’s health: getting the facts right, Health Affairs Blog, Sept. 2, 2015, http://healthaffairs.org/blog/2015/09/02/planned-parenthood-community-health-centers-and-womens-health-getting-the-facts-right/. 11. Rosenbaum S, Can community health centers fill the health care void left by defunding Planned Parenthood?, Health Affairs Blog, Jan. 27, 2017, http://healthaffairs.org/blog/2017/01/27/can-community-health-centers-fill-the-health-care-void-left-by-defunding-planned-parenthood/.